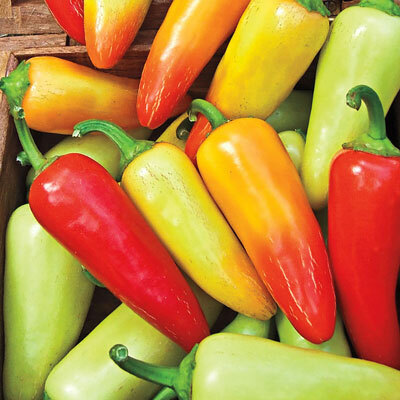 Gorgeous 3-in.conical fruits turn an array of yellow,orange and bright red appearing all at once! Mildly hot with a piquant flavor that is fantastic in homemade chilis and salsas. Also great for fresh eating and frying. 74 DAYS. For each offer ordered, get approx 20 seeds. Spacing: 18-24 in between plants, 24-36 in between rows. Depth: Plant the seeds 1/2 in. deep. Start seeds indoors 6 - 8 weeks before the last frost date. The plants should be planted the same depth as in the pots. Fruit: 3 in. x 1 in. conical fruits that turn from yellow to orange and finally to bright red.